Outdoor autumn wedding ceremonies can be tricky in the Colorado mountains because the weather can be anything from warm and sunny to freezing cold and snowing. This bride hoped for the best with her early October wedding ceremony, but was also ready to brave the worst. 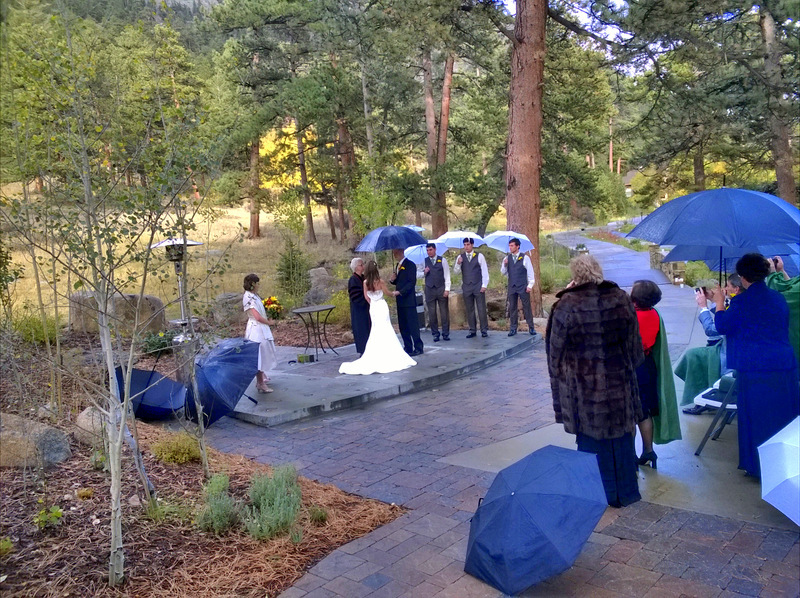 It was clear to see why she wanted an outdoor wedding ceremony at Della Terra Chateau in Estes Park. 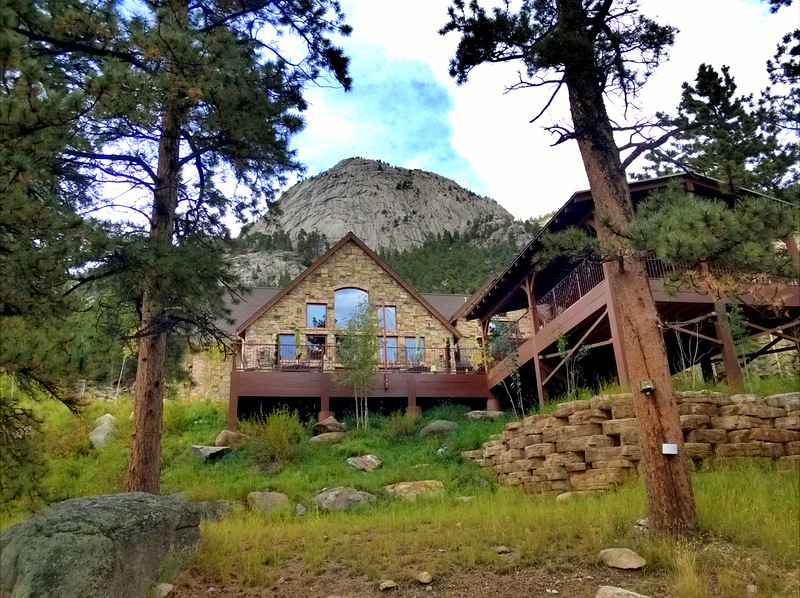 The chateau is beautifully situated in the mountains and gives the feel of majestic isolation that is pure Colorado. The grounds feature garden areas and small ponds and bridges that blend well into the wild Colorado landscape. Wildlife abounded and I saw several elk, wild turkeys, and many birds and chipmunks. Inside, the chateau was built to reflect the classic European charm of years gone by. I had no idea what to expect from the weather as I drove up the fog-shrouded mountains. The forecast was calling for thunderstorms and even snow later in the evening. When I arrived at Della Terra, it was cold and cloudy and I set up under a small musician pavilion to protect my flute from the drizzling rain. The bride chose solo flute music for her wedding ceremony, and I played elegant music on my flute as the handful of guests began arriving. As the guests arrived, the cold rain began to fall in earnest and umbrellas were quickly supplied to the guests and they wrapped themselves in the warm blankets that had been provided. I chose cheerful spring-like music to give the atmosphere a feeling of warmth, and one of the guests later told me that my music was the perfect balm for the cold, dark weather. The processional began, and just as the bride reached the front, the sun came out and the rain abated just long enough for a beautiful ceremony to take place. On Saturday, our flute, viola, and cello trio played for a wedding ceremony at the beautiful Greenbriar Inn located in North Boulder. The couple got married outside surrounded by warm autumn colors drenched in late afternoon sunshine. This couple chose to select all of their own music including their own prelude music. They chose favorites ranging from classical, to ragtime and popular. I made several special music arrangements for our trio to play including “New York, New York”, “I Feel Pretty”, and “When I’m 64”. We played the prelude as the guests enjoyed light refreshments, and just as the sun began to descend towards the mountains behind the "Chuppah" (traditional Jewish wedding canopy), the wedding ceremony began. The vows went by quickly as the couple chose to say their "I do's" in unison, and guests did various readings. Once the sun set, there was a sharp chill in the air, and everyone went inside to enjoy a warm fire and refreshments.